Enjoy monumental visits and some winery tours, etc.. Walk part of the Camino de Santiago trail. 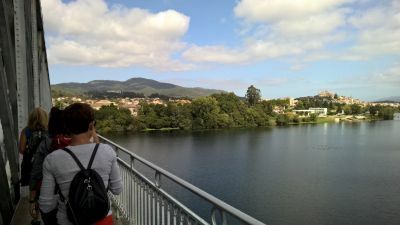 This version of our Camino de Santiago will give you a chance to walk some of the Pilgrimage trail and then following down the beautiful coastline of the Rias Baixas, Galicia, The land of Albariño white wines and Fresh Seafood. In Santiago you will be met by your Galicia Specialist guide (Owner lead) then start our journey to the village of Villafranca del Bierzo in the neighboring region of El Beirzo. In the evening we will enjoy a visit to a winery of the region and as well dinner in the Restaurant that is located next to the wine cellar in an old recently restored Palace. The next few days will be spent walking the most scenic parts of the Pilgrimage trail in Galicia and staying in quaint hotels and manors along the way until arriving in Santiago where we will stay in the luxurious Parador de Los Reyes Catolicos. Our journey doesn`t end here, for the rest of the trip we will visit the Rias Baixas (Low Estuaries) of Galicia. We will stop to visit interesting sites like: Celtic Hill-forts, Romanesque Churches, small fishing villages and of course a few winery visits to sample the exquisite Albariño wines of this region which have been scoring high rating in wine magazines like Wine Spectator. During our tour we will dine in quaint traditional taverns and restaurants to sample the fine Galician Cuisine. You will get a chance as well to stretch your legs with a few light coast walks passing by light houses, etc... in between eating seafood and visiting wineries! Winding down we drive through Northern Portugal to Porto, with it´s world famous fortified Port wines. You will be dropped off at the airport, train station or a city centre hotel if you have opted to extended your trip with one of our post tour addons. Travel by highway (approx. 02h00 - 02h30) to the neighboring region of El Bierzo where we will be staying in Villafranca del Bierzo and where tomorrow we will start following along the Pilgrimage way to Santiago. Before leaving Villafranca del Bierzo you will visit a small winery Bodega Alberto Ledo part of the D.O. Bierzo wine region. Formerly a Fabrica de Almibares y Conservas Ledo (syrups and preserves factory) established in 1818. The building has been restored and it has a cellar for making, ageing and bottling wines on one part and the Wine Tourism project on the other part. You will enjoy a guided visit around their cellar, ageing room, museum, and tasting room. Tour of the vineyards, weather permitting. You will stop at many pilgrimage villages along the way visiting various churches, monasteries and cathedrals. This village is also known for its artisan cheeses “Queixo do Cebreiro” so you can enjoy a taste at a local cheese store before leaving. Then we will continue on to Samos where we will visit the Monastery and have lunch on your own, could try at one of the local tavern alongside a riverbank. Leaving Sarria your chauffeur will drop you at the starting point for today's walking portion of the trail to the village Portomarin with picturesque views of the Galician countryside. In Portomarin you could visit the village and the medieval church which was moved stone by stone (1956-1962) to its present location before the valley in which it lay was flooded to make a reservoir. Then we continue on passing through other Pilgrimage village like Palas de Rei. Then we will walk into Santiago de Compostela the end of the way. The monumental tour will end at the market and that is when the foodie adventure will begin. You will meet our foodie guide who will take you on a walking tour of the Market then enjoy a welcome to Galicia tapas crawl at 2 or 3 different bars/restaurant tasting innovative Galicia tapas from young chefs as well the famous Galician Pulpo (Octopus). After lunch you will have free time and we suggest you visit the Museo do Pobo Galego (Ethnographic museum of the Galician people) a good way to get familiar with the Galician way of life which you will be seeing “live” over the rest of your journey. We will make our first stop of the day at probably the most impressive ruins from Galicia’s Celtic past, the Celtic seaside ruins/hill-fort of Castro de Baroña. The walk down from the parking to the fort is along a trail which takes about 20-25mins approx. to arrive. We also pass by the remains of the 17th century defense towers in Catoria, where a battle took place to stop the Vikings attacking up the river to Santiago. Every August they have here a spectacular re-enactment of the Viking invasions that occurred a thousand years ago. The region is divided into sub-zones and this zone we will be visiting today is the Salnes Valley. Our first winery stop will be at Bodega Pazo Baion winery. This boutique winery is owned by the large cooperative winery Adega Condes de Albarei. They bought this Galician Pazo (Manor House) to make high-end albariño from the privately owned vineyards. They only produce around 40,000 bottles a year of the Pazo Baion Albariño wine whereas the father cooperative winery Condes de Albarei make 3 million bottles a year. Then on to our second winery visit is nearby and also located within another elegant property and with lineage, Bodega Pazo de Señoráns winery merges history with avant-garde. It shares the ground with a mixture of new and ancient buildings, some of them dated to mid-16th century. It has 19.8 acres of vineyards and an annual production of 350,000 litres both in stainless steel and oak casks. Its grape variety is 100% Albariño. After this visit Cambados village, the heart of Albariño wine country and has just be selected by RECEVIN, the European Network of Wine Cities as Spain’s European city of wine 2017. They won over famous wine cities like: Aranda del Duero (Burgos), Vilafranca del Penedés (Barcelona) and La Palma del Condado (Huelva). Dinner on your own tonight, Cambados has a quaint old quarter where you could choose from one of them many restaurants for dinner. Or we can even book you a table at a Michelin star restaurant on request. Starting the day we visit one of the best examples of what all Galicia's fishing villages use to look like. Combarro stands out for its harmonious combination of popular Galician architecture, with traditional houses, granaries and roadside crosses. The present-day layout dates from the eighteenth century. Continuing on we follow along coast to the next peninsula of O Morrazo on the other side of Pontevedra Bay. In the small village of Bueu we will visit the market and have a seafood lunch in a local restaurant with spectacular views of the beach and bay. After lunch in the small village of Hio we visit the Wayside Cross of Hio the most famous in Galicia and built from on solid block of granite. Beside the cross is the Romanesque Church of San Andres (St. Andrews) we take a peek inside before leaving. Then off to what is known as Cabo Home (Man's Cape) in Donon here we see a few lighthouses (including an Ancient Celtic Lighthouse at the top of Monte Facho) all with excellent view of the Cies Island in front. For those who would like to get some light exercise we can walk some of the trails between the lighthouses on the coast with views of the golden beaches, Cies Islands and Vigo Bay with the city in the backdrop, our next stop. After this transfer along the Galician side of the Miño river to visit Bodegas Terras Gauda, an Albariño winery located in the O Rosalsub-zone of the D.O. Rias Baixas. We will have a traditional seafood lunch with lobster and rice what this village is famous for. After lunch we will make our way to the top of the monte St. Tegra with remains of a Celtic Hill-fort and amazing views of the coast and the miño river meeting each other. Then pick us up and transfer along the beautiful coastal road to the lighthouse of Cabo Silliero. If you are still up for more walking we can take the coastal road bike/walk path all the way into Baiona ending in the old quarter (Walking Distance/time: 5kms, about 1hr30mins approx.. walking). If you are not up to long walk we can always go straight into Baiona for a walk around the seawall trail of the Parador Castle of Baiona to see the views of the Cies Islands. The walk is about a 30min walk. Dinner will be based on a walking tapas and wine tour in the old quarter in Vigo with your foodie guide. You will visit 3 different places and try some excellent tapas accompanied by wines! A great night on the old quarter. Today we drive by highway to the Condado de Tea valley, another sub-zone of the D.O. Rias Baixas and the last on our journey thru the Rias Baixas wine region. We will arrive at Arbo "Villa da Lamprea" (village of Lamprey Eel) this village makes a special dish that is known as a delicacy and people come from all over Spain at the time of the festival to try it. The 1st stop will be at the winery Bodegas Marques de Vizhoja winery. The winery is located in south-eastern Galicia in the border area between Spain and Portugal. Found on the banks of the Miño River, and they have almost 40 hectares of vineyards on the Moreira Estate, which boasts an impressive 18th Century country house. The company, produces more than 1,500,000 bottles per year, constantly striving for high quality, innovation and development, as well as a combination of modernity and tradition. Since 2013 the winery has the distinction “Q tourist quality” granted by the Spanish Institute for Quality Tourism. We will enjoy a special visit of the vineyard, winery and old Manor house with a tasting of their wines. Our meal will be based on local cuisine and of course we will try the Lamprey eel! After we will go down to the natural border cross the Miño river between Galicia, Spain and Portugal here you will learn how they catch lamprey eel. Then we cross the border over into the Vinho Verde wine region of Portugal. We will stop to enjoy a tasting at the Adega Reguengo de Melgaço winery in a quaint manor house. You will compare how the Albariño (or should I say Alvarinho as we are in Portugal!) grape variety tastes on this side of the border! To get the best views of the wine regions on both side of the Miño river we will visit the tower of Melgaço in the old quarter of the town with panoramic views of the vineyards. A magical land, true wine country life on both sides of the border. (L): 5 Lunches based on a selection of restaurants in special locations (eg. picturesque coastal towns, etc…) offering cuisine from traditional to innovative style, tapas, tasting menus, seafood, etc... all accompanied by wines of each regions visited. Transportation as specified per itinerary with in sedan car (eg. Mercedes E-Class or Audi A-6) for 2 People and minivan (eg. Mercedes Benz Vito or VW Caravelle) for 3 to 6 People. Entrance fees included when with guides, other entrance to monuments to be paid directly when you are on your own.